The Lumberjack® is a high speed (up to 50,000 rpm), low torque multi purpose cutter. The rotation of the Lumberjack® is powered by the water pressure supplied by a common sewer jetting or combination truck. 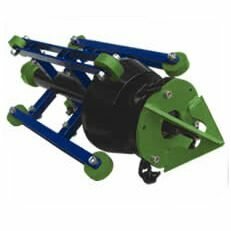 Although it is designed to cut roots, many of our customers use it for cutting concrete, grease, mineral and chemical deposits, tuberculation and protruding laterals. We know of no other cutter that is as versatile, reliable and user friendly for common, everyday cutting jobs. The Lumberjack® series operates in pipe sizes from 3″ (75 mm) up to 48″ (1200 mm).